Every year we get excited for the panto season: a night of nostalgia at the theatre as classic tales are retold with a modern twist, along with some humour and catchy songs thrown in that take us weeks to stop singing. Cinderella performed at The King’s Theatre this year is no different, and certainly does not disappoint. With familiar faces such as Karen Dunbar, Gavin Mitchell and Des Clarke, there is a predictably Scottish theme permeating the evening as the majority of the jokes mock Scottish culture, highlighting our nation’s fantastic ability to laugh at ourselves. Dunbar is the star of the show, playing the comical role of Mrs. McConkey/Fairy Godmother, opening with a new twist (which I won’t spoil). Within seconds, the skit between the ‘producer’ and Dunbar has the theatre howling in hysterical laughter. The scenes which take place in “The Village of Gorbals-on-the-Green” and “The Forest of Govan” show a distinctly Glaswegian take on the traditional story. Cinderella, played by Jenny Douglas – one of the final ten in the BBC1 programme Over The Rainbow – kicks off the show with “Footloose”, an upbeat and cheerful way to reel the audience in. Throughout the evening, the characters are backed by four professional dance couples and eight young children as well as fabulous stage props and backdrops which give the panto a glamorous and festive feel; but what really brings the stage to life is the outstanding choreography. The dancers execute moves and lifts like they’re on Strictly Come Dancing, whilst the younger children perform smaller but effective routines at the side of the stage. 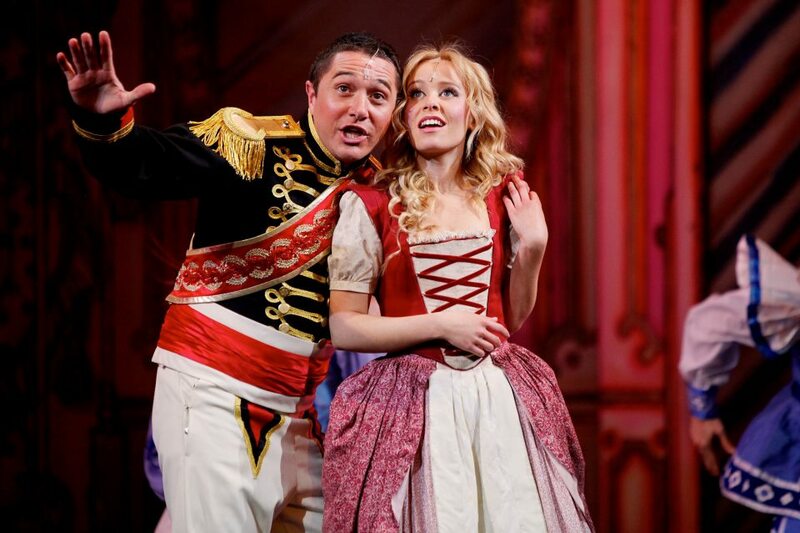 Cinders and her Prince meet when he and Dandini (Prince Charming’s man servant) swap roles for the day. Here they perform a duet of The Calling’s “Wherever You Will Go”, which is enough to melt any Scrooge’s heart, as the dreamy dance routine matched Kieran Brown’s (Prince Charming) beautiful tones makes everyone believe it is a real love story. Since the now love-struck Prince does not catch Cinderella’s name, he organises a Royal Ball and hopes to find her by inviting all the girls in the land. However, Cinderella’s two monstrous sisters (played by the side-splitting Gavin Mitchell and Gordon Cooper) have her rip up her invitation. Luckily, though, her Fairy Godmother comes to the rescue.hed with Kieran Brown’s (Prince Charming) beautiful tones has everyone believing it is a real love story. The end of the first half is spectacular; the Fairy Godmother and Cinderella sing together whilst the stage elegantly and discreetly transforms to display a magnificent carriage drawn by the cutest pair of white Shetland ponies ever imagined. I was slightly concerned for the ponies’ welfare with all the flashing lights and loud noises, but they seemed happy to be on stage as they were fed some treats. 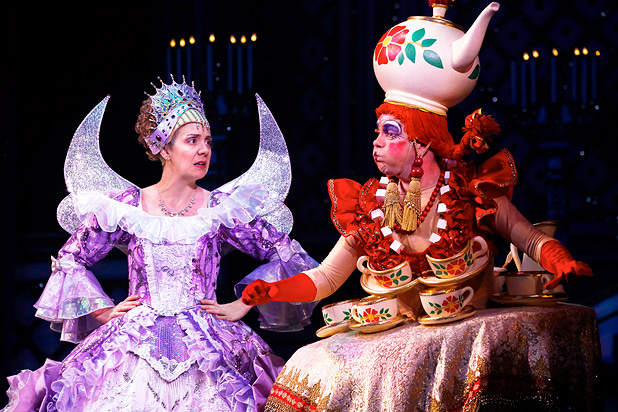 The second half is just as entertaining if not more so than the first, with the actors ad-libbing outrageously as a sketch between the Fairy Godmother and one of the ugly sisters, Pixie (Gavin Mitchell), descends into comedy chaos. What is key about this pantomime is that it works on many levels. There is something for the kids, but also a lot more for the adults to laugh at too. Buttons (Des Clarke) brings the production to a close as he has the crowd up on their feet for when ‘the cloot comes down’. At the performance I attended, he perfectly summed up pantomimes to a group of American students as ‘Glee with Buckfast’. It was without a doubt a night to remember. And it really is unfortunate if you don’t get a ticket. But have a very Merry Christmas, and a Happy New Year.